Night Stay Accommodation Online Booking Tariff Jim Corbett National Park, Online Jim Corbett National Park Accommodation Reservation, Corbett Accommodation Permit. Welcome to Night Stay Accommodation Booking to Corbett National Park. Visitors can book online Night Stay Accommodation for different zones of Corbett National park namely Dhikala - Bijrani - Jhirna - Sonanadi - Durgadevi - Dhela. 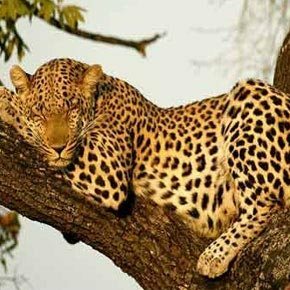 All the procedures of Night Stay Accommodation Booking at Corbett are managed by the forest officials as per the guidelines of India's forest department. Please note that we cannot influence the night stay accommodation zone, night stay accommodation, safari driver and the naturalist guide as it is not in our hand. It is solely decided by the forest officials. Though all the zones have healthy population of tigers and wildlife sightings are reported more or less same. These all aspects are managed by the automated computerized system to ensure the equal distribution of night stay accommodation in respective zones. The Traveller has to carry the same ID Proof as submitted in this form, while visiting Jim Corbett National Park. ID Proof: DL Number, PAN Card Number, Voter ID, Passport Number (Only for Foreigners), etc. The Traveller has to carry the same ID Proof as submitted in this form, while visiting Corbett National Park. Pick-up & drop point for safari is Ramnagar city but can be done from any Hotel/Resort on extra cost which depends on its location. For those people who would like to experience the wilderness of a national park at its best, the option to stay at an FRH (Forest Rest House) inside the park is the best option. When the sound of various animals comes from the dense dark forest, nothing in this world compares with that feeling of joy mixed with fear. When you pick up your torch to have a look at your surroundings, you can sight lots of eyes glowing in the light of your torch from the outside of the Rest House's electrical fencing. Deere, Wild Boars and sometimes even Tigers can be seen and heard very close to the fencing of the Rest House. Dhikala Forest LodgeDhikala Forest Lodge has 25 rooms & 2 dormitory with 12 beds in each dormitory. 25 rooms are further divided into 5 categories. The Dhikala area of Corbett National Park is probably the finest unspoilt and abundant in wildlife area existing in Northern India, very rich source of wildlife, fauna and flora and that has extreme natural beauty. The vast dense grasslands called "Chaurs" like the "Savanah" in Africa exist only here. The Dhikala Forest Lodge built in the year 1936 is situated on the edge of the Ramganga Reservoir overlooking the forested hills of Kumaon & Garhwal. An overnight stay here provides the real wildlife experience with the opportunity of doing Elephant rides, Jeep Safaris and spending mid mornings on observation towers overlooking the Ramganga river and water holes. 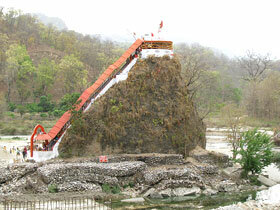 It is 50 km away from the Ramnagar Railway Station. The location of the Dhikala Forest Lodge offsets its basic accommodation- though these facilities have been immensely improved in 2006, as it is situated deep in the heart of the forest and wildlife can be observed can from the verandah of your room. The rooms at Dhikala have been renovated and are no longer basic by Indian Jungle standards. Dhikala forest Lodge is located in the core area of Corbett national park and it is enclosed by an effective solar fence for your safety against wild animals. The rooms are clean, with floor tiling and attached English style flushing toilets. Showers do exist and the mixers work - bucket baths are recommended, in case of malfunction. Running hot and cold water is surely available but we suggest mineral water for brushing the teeth.The lodge has electricity with supply timings and there is a back up generator and inverters. Wildlife films are shown every alternate evening in a make shift theatre and the lodge boasts of a fine wildlife library. We are a personalized service organization managed by Wildlife, Bird watching and Fishing experts, and the pioneers of Wildlife Safari Tours to Corbett & Dudhwa National Parks. Our overnight tours to Dhikala & Gairal Lodges inside the Corbett Park are a must for the Wildlife enthusiast, for a complete visit to this natural heritage of Corbett Park. We carry our own clean bed sheets, pillow cases, towels, table cloths, hot water bottles, mosquito repellent coils and other necessary items to provide comfort in the wilds. The restaurant serves only vegetarian Indian, Chinese & Continental food served in Buffet style - the crockery is stone ware. Liquor is not available and allowed but some guests do carry their medicinal stock. A stay at Dhikala is an experience and recommended for the "adventurous & forgiving wildlife traveller". After Dhikala Lodge, Gairal lodge is the most preferred forest lodge amongst visitors. Gairal forest lodge is located on the banks of ramganga river. Gairal forest lodge have electricity for a few hours in the evening via generator. Sarapduli Forest LodgeSarapduli forest lodge has 2 standard rooms & 1 dormitory of 3 beds. Sarapduli forest lodge is located on the way to Dhikala lodge from Dhangari gate. Most centrally located rest house facing the ramganga river at Dhikala zone is Sarapduli lodge. Due to the proximity to the river in front, movement of tiger & elephant are more at Sarapduli forest lodge. For bird watchers & to see crocodiles, Sarapduli forest lodge is the best place. Sultan Forest LodgeSultan Forest lodge has 2 standard rooms. Sultan forest lodge is the first lodge you will come across,when you drive from Dhangari gate to Dhikala Lodge. Sultan Forest lodge has 2 rooms only. Solar fencing is not around Sultan Forest Lodge. It is named after Sultan Sot (local seasonal stream) which flows through this region. Corbett National Park offers you with the facilities of Jungle Safari. One can look for nature safari, to have bird watching and enjoying the precious nature. You can also have Jeep safari through the jungles of Corbett and if lucky enough can even spot some tigers. If adventurous further or to have some memorable moments, can take up an Elephant safari, really amazing experience. Day visit to all zones are strictly regulated as per the scientifically calculated carrying capacity and only a limited number of vehicles are permitted entry during each morning and afternoon. Permits for day visits to the Sonanadi Ecotourism zone can be obtained from the visitor reception center located at Kotdwar. Permits for day visits to other zones are available online on our website. Visitors are advised to acquaint themselves with gate timings and arrive well before the designated time to avoid any inconvenience. Private vehicles are 'not' allowed entry for tourism purposes into the park and visitors use specially designed vehicles, registered with CTR for this purpose. 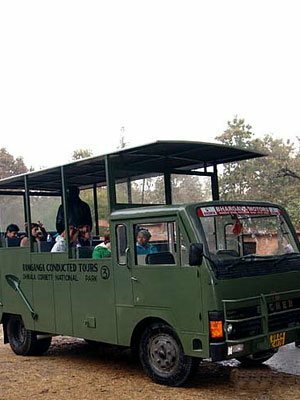 Day visits to the Dhikala Ecotourism Zone are permitted only through the specially designed Canter buses via Ramganga Conducted Tours. Visitors can also enjoy elephant rides at Bijrani and Dhikala ecotourism Zone, which is available on 'First come, first get' basis. Canteen facilities are available at Dhikala, Bijrani and Gairal. At other locations, kitchen facilities have been provided. Attached toilets :- yes except in dormitory. AC in the rooms :- No. TV in the rooms :- No. Tea cattle maker in the rooms :- No. Electricity :- Only Dhikala lodge has fixed electricity line. Electricity in all the other rest houses are provided by solar panels. Restaurant / Canteen :- Dhikala and Gairal lodges offer canteen with buffet meals. Other lodges provide kitchen facility with room attendants. Room category :- Tough there are different room categories but all the rooms are similar. Even rooms with same category may vary from each other. Location :- All the lodges in dhikala zone have excellent location and offers a wonderful view of forests and provides a rich and unique experience. Safety :- All the rest house except sultan are covered with solar wire fencing to keep away the animals entering the forest lodges. Dhikala is the most famous forest lodge in Corbett National park. Situated 32 kms inside the jungle, Dhikala forest lodge offers breathtaking view of Ramganga reservoir. Dhikala forest lodge has most number of rooms in the park. There are 2 canteens inside Dhikala Forest Lodge. Dhikala forest lodge is located in the hearth of Corbett national park on the bank on Ramganga reservoir. Dhikala forest lodge or Dhikala forest rest house is managed by forest department of Corbett national park and provides an opportunity to the visitors of the national park to stay inside the forest. Picturesque location and beautiful surroundings make it an ideal place to stay away from the hustle bustle of city life. Dhikala forest lodge is the only lodge within the national park which provides the facility of electricity within the rooms and thus is ideally suited for families. In order to reach Dhikala forest lodge, one has to enter the Corbett national park via Dhangarhi gate. 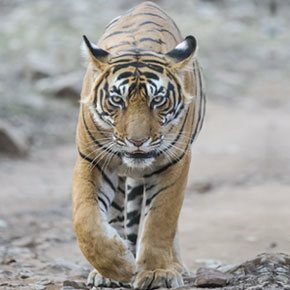 The distance of Dhikala forest lodge is 32kms from Dhangarhi gate and as soon as the vehicle enters Dhangarhi gate, one gets the idea about the beauty of Dhikala zone. 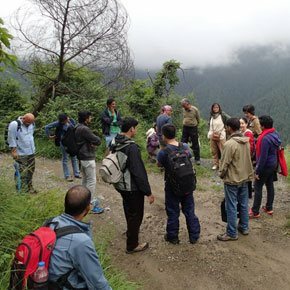 Other lodges like Gairal, Sultan, Sarapduli, Khinnanauli fall on the way to Dhikala forest Lodge. 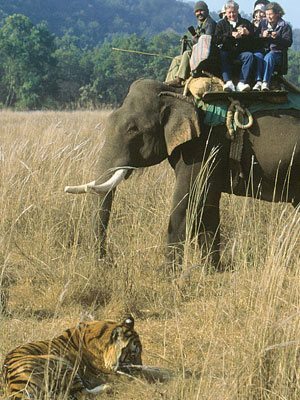 The journey from Dhangarhi to Dhikala forest lodge is adventurous and provides many opportunities for wildlife viewing. For the safety of its visitors Dhikala forest lodge is covered with solar wire fence. The permits for the booking of Dhikala forest lodge are recommended to avail much in advance as it is highly popular amongst visitors from India and abroad. Apart from 32 rooms, Dhikala forest lodge also has 02 dormitories, with 12 beds in each dormitory. Bathrooms in the dormitories are common. All 32 rooms at Dhikala forest lodge has attached bathrooms & running hot (solar) & cold water. The Campus of Dhikala Forest Rest House is located in the core area of Corbett National Park. The food in Dhikala forest lodge is not a problem as there are two canteens within the premises of lodge. One of them is run by Kumaon mandal vikas nigam which is run by the tourism department of Uttarakhand and offers buffet meals. Other is a private canteen which offers food in alacarte menu. Dhikala zone has one of the most picturesque and beautiful landscape in the world and the rich wildlife in the area adds to its charm. 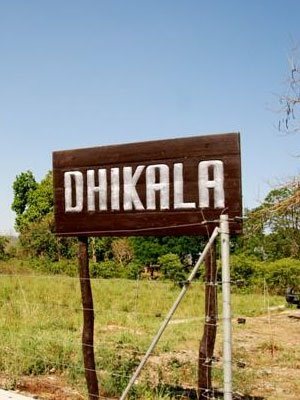 Dhikala zone if the biggest zone of Corbett national park open for its visitors and provides wonderful chances of game viewing. Dhikala zone gets its name from Dhikala grassland, which is one of the biggest grassland of the national park supporting variety of wildlife. Other than grasslands Dhikala zone has sal forests, mixed forest and variety for flaura. Lifeline of the zone is Ramganga river which supports the wildlife in the area and adds to the beauty of the forest. Dhikala zone of Corbett national park again tops the chart when it comes for the opportunity to stay inside the national park. There are five rest house/ lodges within Dhikala zone, which are run by forest department for staying of the visitors of Corbett national park. Dhikala forest lodge, Gairal Forest lodge, Sarapduli forest lodge, Khinnanauli forest lodge and sultan forest lodge are the names of rest houses within Dhikala zone. Other than sultan forest lodge, all the forest lodges are covered with solar wire fencing for the safety of the people staying in the lodges. Out of all the lodges Dhikala forest lodge is the only lodge which has got electricity. 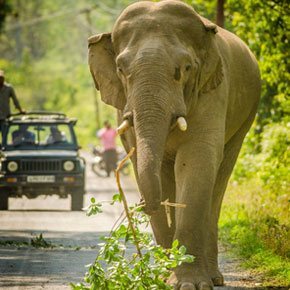 Dhikala zone is open for tourists from 15th Nov to 15th june every year and during the remaining period it remains closed due to monsoons as many streams cross the road leading to Dhikala zone and it gets impossible to cross the streams due to high water levels and pressures. There are many tracks like thandi sadak, champion road, sambar road, car road, ram singh road, kamar patta, main road, moda dal road, shikari batiya developed in the Dhikala zone to enhance the chances of wildlife sighting. 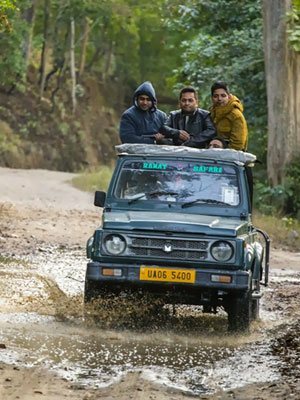 Dhikala zone of Corbett national park can be visited by jeep only when one has the permit for staying within the forest lodges inside the dhikala zone. In case someone is staying in the resorts at the periphery of the national park, one can visit Dhikala zone by canters or open buses which are run by the forest department. Our recommendation for the people visiting Dhikala zone if that one should keep the expectations low in terms of luxuries but staying at a location like lodges in Dhikala zone is a privilege and it is not a bad deal compromising on luxuries but getting unmatched nature and beauty. Corbett Forest Lodges Permits would be issued for a maximum of three days only. Permit is not transferable and once the permit is issued it is not refundable. The park authorities shall not be responsible in any way for damages caused..
Corbett National Park is considered as one of the most expensive places in North India. So here we are offering the Budget Tour Package in Corbett National Park with the best possible price which will not burden your pocket. Price: ₹ 3,500.00/Person* Available today! Dhikala is one of the most popular sought after tourist accommodation place in Corbett National Park and tracing the tiger in the most thrilling activity you can possibly do in Jeep(Gypsy), Elephant & Canter. Price: ₹ 6,500.00/Person* Available today! After Dhikala, Gairal is the most preferred forest lodge amongst visitors which is located on the banks of Ramganga river. Gairal forest lodge have electricity for a few hours in the evening via generator. Get special discounts for College Group / School Student Group / Corporate or Company Group / Call-Centre group (More than 20 persons), packages available as low as INR 1200-1500 per student or person respectively. Price: ₹ 1,200.00/Person* Available today!